At just four minutes to midnight on July 4th, WMATA announced that all of the 4000-series cars on Metrorail were being removed for safety concerns related to their door motors. 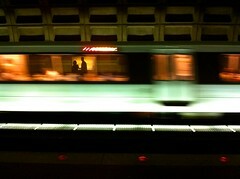 The timing, while awkward, may prove advantageous given the lower than average ridership week and the federal holiday. The 4000-series cars apparently have an issue with their door motors that can occasionally cause a door to open while the train is moving. Each of the 100 cars will need to have all of its door motors removed, inspected, cleaned, and replaced before the cars can come back into service. It’s expected to be a process that will take 2-3 weeks. Early next week is expected to be the worst of the situation, as cars will be coming back online in pairs as the work is completed. Thanks for using my photo! You’re welcome to use it bigger if you’d like!